There aren’t many places on the Oregon Coast that you can backpack, but leave it to my boyfriend to find one. 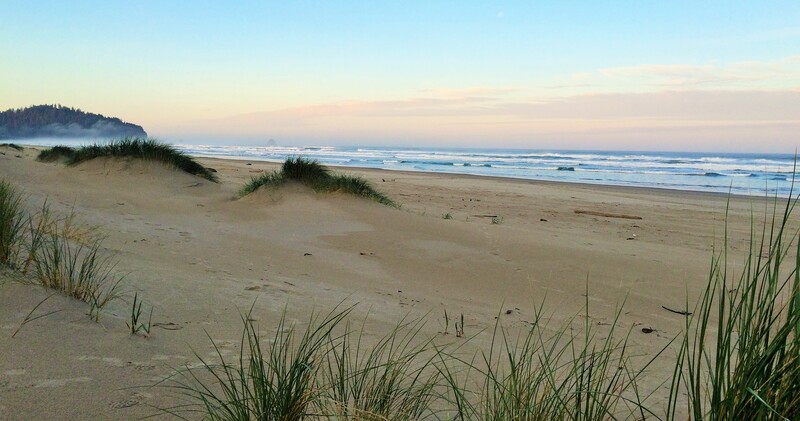 Located just an hour and a half drive from Portland, Bayocean Peninsula is a quiet and serene stretch of sand that jets seven miles north of Cape Meres near Tillamook on the north coast. Just park your car at the trailhead, grab your pack and camping supplies and walk the gravel road to numerous beach access points and old backcountry camping sites. We opted to just set up camp on the sandy dunes and watch as the sun illuminated the waves the next morning. With 6.8 miles of trail and crowd-less sandy beaches, this stretch of coast is a beauty for a easy-weekend away from the city. But what makes the Bayocean Peninsula even more intriguing is its unique history. Once the site of a popular beach resort community, the peninsula housed a flourishing town, 1,000-seat movie theater and bowling alley. Tourists flocked to the resort from Portland, traveling by train and then ferrying across Tillamook Bay. But after the creation of a jetty on the north side of the bay, the peninsula started to erode away, and as a result the resort and homes as well. Imagined as the “Atlantic City of the west”, the split finally completely washed out by 1954, making Baycoean an island. The area became better known as the town that fell into the sea. Read more about Bayocean Resort and potential future plans for this unique ecological and historic site. Thanks to the unruly power of the ocean, the Peninsula returned to its quiet beginnings and today rewards those who ventures to its sandy shores. I enjoyed one of my best nights sleep in a while on its soft dunes. Note: There are signs at the peninsula parking area that say “no camping.” These refer to restrictions against car camping in the parking area.